The Honeygold is a cross between the Kensington Pride Mango and an unknown variety. The Queensland-based Piñata Farms owns the rights to Honey Gold mango. The mango has rich sweet flavor and a firm, fiberless, juicy flesh. It has a yellowish-orangish flesh and a brilliant golden/apricot skin color. 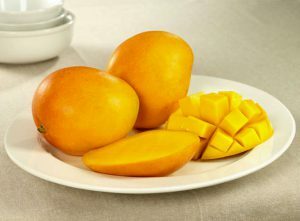 The season for Honeygold mango is November to March.